Do you work for Moodle? We’ve grown Moodle since 2001 as an open source platform that empowers educators to develop and manage courses online. Moodle is a modular system based on plugins, which are like lego blocks that you put together to build whatever you want. There are plugins for different kinds of content, and plugins for all kinds of collaborative activities, which is where Moodle really shines. As an example our Workshop plugin manages a full peer assessment process, so you can get hundreds of students accurately grading each other’s assignments (that can save you a lot of time!). Add some tracking and reports and the ability to add more plugins from the community or even ones you write yourself, and you can build some pretty amazing education environments. The Moodle project is run by Moodle HQ from Perth, Australia, but would not be what it is without a huge community of users. Our community work together and help each other on moodle.org (itself a Moodle site), where they’ve taken Moodle’s founding principles of feedback and collaboration online and practise it in our Moodle forums, our wiki-based Moodle Documentation, our Moodle Tracker for bugs and new features, our course-sharing site Moodle.net, and our Moodle Translation portal (which means you can use Moodle in over 100 languages!). Learning about Moodle? We can help. "Great for class material organization"
"A good LMS tool for web based learning"
Moodle has a good user friendly interface that allows users to navigate to their area of interest without much difficulty. Their documentation was detailed enough for our implementation of the product. We liked the mobile app feature of Moodle which allows us to interact with students easily without having to resort to emailing. We are still in the midst of trialing the software and have not found any reason to dislike this product. If there was one thing to mention, it could be that the UI could be better improved for the users involved. Start off by utilizing the Free software and getting a good feel of Moodle before commiting to using this good LMS tool for your education needs. Another good tool could be BlackBoard. Using Moodle allowed us to create course and content for teachers and students alike. This LMS allowed students to receive updates of their course assignment and grades easily. "Has lots of features but the interface is not user friendly"
I have used this product for over 8 years as an adjunct instructor for the University of Dubuque. The feature I like the most is the "copy" function in order to import one class from last semester to the current semester. What I dislike about Moodle is that from an instructor perspective this software is not as user friendly as I would like. I'm sure this has to do with the options each education establishment chooses but in order to change dates on an assignment or change grading requirement, it takes longer than it should. Depending on the options your University selects this is a robust software. However, some features can make the software very cumbersome. I wouldn't say it's hard to learn but just a little clunky. The problem being solved with Moodle is a standardized method of organizing the educational environment to include grading, assignments, registration and communication. The benefit is that information is easily accessible to myself, the administrators and the students. "Using Moodle to connect with students"
Easy to navigate around, and set up courses. It's the market leader in learning platforms. It's the market leader in learning platforms. Moodle es un software de licencia GPL, es por tanto libre y además es gratuito. - Permite crear cursos y matricular de forma seguro mediante clave a los alumnos. - Organizar tu material de clase como profesor: esto es, añadir y organizar por temas archivos de diferentes extensiones para apuntes, presentaciones, enunciados de trabajos, y añadir enlaces que resulten de utilidad a los chicos. Si algún alumno no puede asistir a clase, aquí podrá seguir el material impartido. - Permite crear tareas, con una fecha de inicio y otra límite para que los alumnos entreguen en dicha tarea las prácticas o trabajos que estén haciendo desde sus cuentas de usuario. Así no tendrás que estar recordándoles contínuamente el día final de entrega. - Se les puede evaluar y ellos ver sus notas. - Permite conexión constante con ellos, tanto pública como privada.Puede hacer preguntas y nosotros como profesor darles respuesta o bien ayudarse entre ellos. - Permite realizar exámenes en línea. Lo que no me gusta es la interfaz, algo desfasada. Administrar un sitio Moodle no es sencillo, requiere un periodo largo de implantación, con fase de estudio previo, porque la interfaz es intuitiva, pero no tanto como me gustaría. Si no eres administrador, y simplemente tienes que ir organizando el material de tu curso, es mucho más fácil de gestionar, pero también lleva su tiempo hasta que te adaptas a los controles del programa. - Si te quedas sin conexión un día en el aula, estás "vendido" y tendrás que sacar algún recurso para no perder la clase ese día. Si piensas que la organización de tu clase es mejorable y que no aprovechas las posbilidades de internet para hacerlo y tener mejor seguimiento de tus alumnos, lánzate e instala moodle. Es gratis. En Madrid educamadrid lo ofrece a todos los centros concertados y públicos. Úsalo!. Nos ha facilitado el seguimiento personal de cada estudiante, la comunicación ellos y entre ellos. Nos ayuda a organizar nuestros cursos de forma segura con claves de matriculación. Nos costó aprender a administra la plataforma, pero una vez superada la etapa de aprendizaje no podemos estar más contentos. El trabajo en el aula desde que usamos Moodle es más sencillo y sin haber tenido costes económicos. 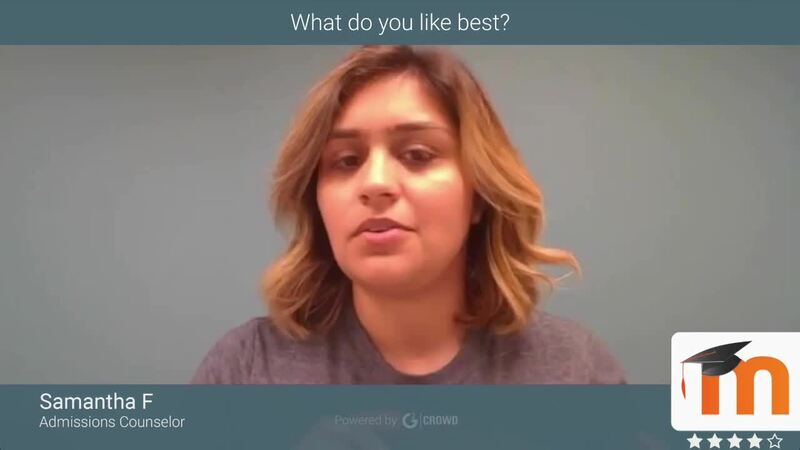 "Moodle, one of the top LMS"
What I like most about Moodle is the ease of creating and cloning courses, including their students and enrollments. Its scalable system in terms of the number of students and the creation of virtual courses and virtual learning environments. It is one of the best tools to administer courses both in your own company and in a teaching environment. Many features, good community and easy scaling. With Moodle you can have a great solution for all students from a small institute to a large university. Also add that it has a large community of developers, so it will never lack any functionality. Great platform for both the user and the admin team. Easy to navigate around, and set up courses. That online learning is the way of the future. Students do not have to attend class if they live out of town. Bening able to assess students work online, and being able to mark online with the collaboration of Turnit in. We can access students from all over NZ that would not necessarily enrol because of location. "Nice software for making Course Website"
I really liked the software as it is very useful for making websites in which i can start my various courses. It is very easy to use and very fast also. I don't have any dislikes for Moodle as it is very good and useful. I will recommend you all to to just go and try moodle as it very good for making websites on which you can start your own courses teach online. I have experienced many benefits after using moodle. Like i am able to make my own websites on which i can start my own online courses which will help me in my e learning. Also as it is very to use so i am able to save my lots of time. I like the fact that the instructor can be self reliant for most tasks and the administrator doesn't always have to be available. I like the importing of previous classes to new classes that are teaching the same content. The ease of this is awesome and a coordinator can do this as well. The ease of use is not always there from the instructors and students. It's a little more clunky than some of the other LMS' I have seen. I don't like how many clicks it takes to get to certain screens. It would be better if it only took one click from the main screen to get to anything that they need. One other thing I dislike is having to turn editing on and off all the time in order to change something or add something. Maybe need to have a screen that keeps you from deleting it so easily but not for adding or changing something. We are solving delivering online class content high school students during their regular schedule rather than at night or some other time. Also being able to deliver the same content to other adult students that need to work but could take a class online. This allows for their own time management. "Moodle an Adequate Tool for Web-Based and Lecture-Based Courses"
The GUI is better than average. Many functions are fairly intuitive. They try to make all students git on a screen and if they can't you can scroll rather than find and click on a "next page" arrow. You can administer tests online and they work with a few publishers to bring test packs directly into the product. Administering a test online is very difficult and they do not support Parson's test packs which, given Pearsons size, seems surprising. After exam grades have all been entered and you find that a variable (such as value of exam, beta weights, etc. are sometimes not changeable. Extra credit assignments require that you first use the module to add a new "item" and then exit, go to a different module just to check a box indicating it is extra credit. Before you commit to a letter grade you need to manually calculate a few students. I have had Moodle make incorrect calculations. The modules are clunky and use too much nesting. Some modules require you to press "save" (which I like) while other modules do not (leaving me wondering if my data was saved. Compared to similar products used by other schools (I was an adjunct at three schools before getting a full time staff position" Moodle is the least liked by students. For the modules that require that you save your work I would like a prompt reminding me that I have not saved my work. The learning curve compared to, say, BlackBoard seems quite steep. Evaluate BlackBoard and at least one other product before committing to Moodle. For lecture classes all written assignments are uploaded into Moodle. I use it for all grading. I use it to communicate with students and to post explanations for assignments and grading rubrics. For online students the entire course is delivered using Moodle. "Flexible, Evolving Platform for Learning Management"
The software has come a long way over the past 10 years. There is a robust community of administrators and developers is making continual improvements and offering suggestions and support through Moodle's online community. It is free and open-source, and while you should plan to invest some resources in the development, management and hosting of your implementation, our small educational nonprofit saves thousands every year by using Moodle over other commercial solutions. Moodle is also built using web standards that have allowed us to customize a beautiful and simple interface for our students and teachers. The software is *very* resource intensive on a server. Hosting it became a very expensive proposition, but now we host it with a company only provides Moodle hosting and has several scalable plans that can grow with our organization. Also, the back-end can be a bit difficult to navigate & find what we need at times: it sometimes feels clunky & counter-intuitive. Unless you have your own server and a dedicated professional who can manage it, I strongly recommend researching a vendor whose business is to serve Moodle; consider a cloud implementation. The software is very resource intensive, depending on the number of concurrent users, and a managed-hosted solution has made a huge difference. We use Moodle to securely host private course content to students who are matriculated as well as others who sign up for a short course here and there. It allows us to track student progress, their usage of learning resources, collect and grade homework, and securely host files with smart integrations with Google Drive and Dropbox. "All in one learning software"
The thing i like the best about Moodle is its user friendly interface. It is also very easy to use as it gives drag and drag functionality. It is a very good learning management system. It is always up-to-date. I am not having any dislikes for Moodle as it is very good and useful. I will recommend everyone to use Moodle as it is very good and useful. It is a very good learning management software. I am sure ypu guys will love it. I am getting various benefits in using Moodle like i can use it in more than 100 languages and as it is daily upgraded so it gets easy to use it. Also it is very private and secure. "Moodle. Una plataforma educativa versátil y gratuita." Moodle es una plataforma gratuita orientada al sector educativo. Entre sus virtudes destaca los customizable que es, dando lugar a múltiples y variadas opciones. Facilita mucho la tarea de corregir, pues nos permite utilizar nuestras propias rubricas. Es posible crear test y exámenes para nuestros alumno en dicha plataforma y que se corrijan automáticamente, algo que nos ahorra gran cantidad de trabajo. Funciona en un servidor y es posible acceder desde cualquier aparato con conexión a Internet. Moodle es gratuito, pues se trata de software desarrollado siguiendo los cánones del software libre. La interfaz no es nada intuitiva, es muy difícil de aprender a manejar, aunque hay muchos cursos en línea que enseñan a utilizar la plataforma. El auto aprendizaje también es posible gracias a largan cantidad de guías y vídeos que circulan por Internet. El aspecto de la interfaz gráfica es algo obsoleto. Es muy difícil de implementar en un servidor, por eso es mejor si nos lo ofrece alguna institución gubernamental.En España lo suelen ofrecer gratuitamente para cada centro educativo. Muy recomendable, gratuito y versátil. Una de las mejores plataformas educativas en línea que podrás encontrar. En nuestro centro, lo utilizamos de forma gratuitas ofrecido por nuestra comunidad de región, podemos crear aulas virtuales en las que quedan registrados todos nuestros usuarios pudiendo compartir recursos online con ellos, lo que facilita el seguimiento de las clases. Es posible crear tareas para que entreguen ejercicios propuestos para más tarde corregirlos fácilmente con rubricas creadas por nosotros mismos, ahorrándonos mucho tiempo. De cara al estudiante, es una plataforma que les facilita su desarrollo académico pues tienen centralizado en la nube todo el material necesario para superar las asignaturas en las que están matriculados. "The leading learning management system"
Moodle is a powerful Learning Management System that enables us to deliver advanced eLearning solutions to over 250000 learners. Lots of different course formats and activities are supported so you can really get creative with your courses. Moodle can run on virtually any computer, but for large installations you really need some powerful web server hardware and the server must be configured and fine tuned to get the best performance. Learning how to do that fine tuning takes some experience. And being such a powerful system there are a lot of configuration settings to get to know, so you need to take some time to get to know the internals of the system. Invest the time to set it up correctly and get familiar with all the advanced settings and configuration options. We have been able to deliver eLearning and training solutions to thousands of staff, without requiring them to travel to a training venue. They can study in their own time wherever they choose. "Moodle is a great tool for creating online courses"
I have used Moodle a couple of my past jobs. They used it to create online courses for training employees. It is really easy to use, runs without smoothly, and looks really professional. 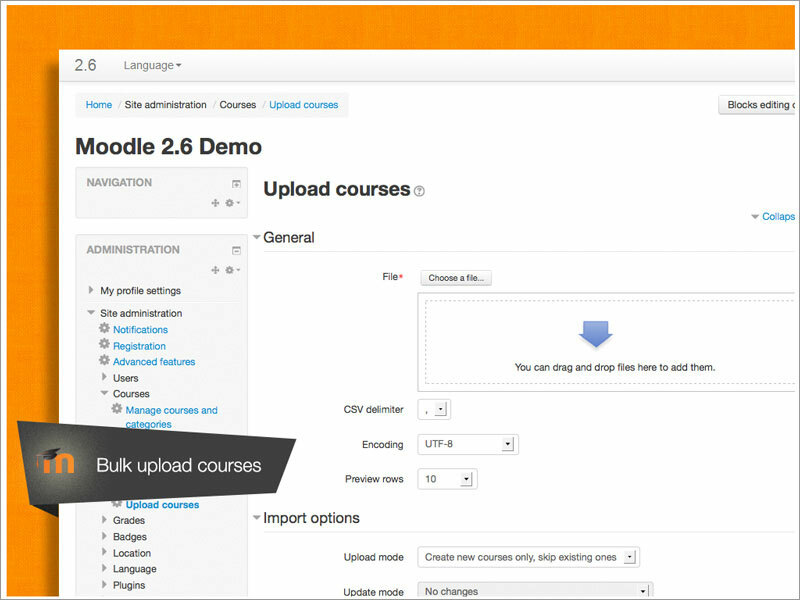 There are hundreds of plugins available for Moodle which makes its customization options nearly unlimited. It runs on most systems that support Php including Linux, UNIX, FreeBSD, Windows, OSX,,and Netware which makes it compatible with all of the major operating systems in use. The user interface could use a bit of an update both aesthetically and functionally. The look is a bit plain and has a bit of a Windows Xp classic look about it . It is possible to login to the same course from multiple locations/devices which makes it possible to accidentally do the same course twice without realizing it until the end. Overall Moodle is really a solid product that works well and offers compatibility with all the major operating systems as well as hundreds of plugins and themes for combustibility however you would like it. I have enjoyed using Moodle during the training process at my last job and found the courses easy to navigate and learn with. I have also taken some online classes that were done in Moodle and it's really pretty great. I have definitely been able to benefit from using it. It gives you a chance to edit a post after you post it. I always catch typos after I submit. It is also a great tool to communicate with people that you cannot see face-to-face. I like how the threads are organized and it lets you keep track of what has been said. I also like that Moodle can email you every time a thread is updated so that you do not miss anything. It does not let you attach large files. I often have to find a different way to share files because the files are too big. It's a useful tool for online collaboration. My organization needs to communicate between 5 different locations. We have tried teleconferences and webconferences, but it is so hard to hear what everyone says. The technology is getting better for webconferencing, but it's still not great. I like Moodle because it lets everyone think about their response and everyone can read what everyone thinks. It helps keep the conversations organized. I love that Moodle lets you edit a post after you submit it because that is when I usually find typos. "Moodle Use for Professional Development"
I have used Moodle for several years as a way to store and present information to teachers and staff members for staff/professional development. I am able to upload numerous documents and other various resources to share with a group of people. I am also able to keep track of what documents have been viewed and what tasks are completed. Users are able to submit assignments for review. I can also secure my courses with a password. Prior to the recent updates, Moodle was difficult to navigate. There is now a dashboard that makes navigating much easier. I find it somewhat annoying that I am able to see all courses within my school district including those courses that do not apply to me. I have also found that the mobile version is not very user friendly. If you are considering using Moodle, it is a great option for providing online staff development courses. It has the capability to store various information that can be accessed even after the course is over. If you have a large number of students or users, Moodle may be a great resource to use. Using Moodle has allowed me to create courses for teachers to complete for professional development. This option allows for staff members to complete tasks/assignments at their own pace and at their connivence. I have also found it very benefical to collaborate on using Moodle with other professionals in my school district to store documents and share resources. First and foremorel, Moodle is free! What is not to like about that. But when it comes to functionality, Moodle is great. I can customize my courses easily, using Moodle for assignment submission which allows for quick grading turn around. The Moodle grade book is customized and very powerful. And the messaging and forum setups are great to facilitate the sharing of classroom information. The learning curve is a bit steep initially. The UI isn't quite as intuitive as I would like, but overall the benefits have outweighed the cons in this area. Setting up the various grade book styles can be very time consuming until you have mastered the process. I think the word I would use to describe Moodle is "clunky." Make sure to put in the time upfront to make sure you get the most out of Moodle. It is a powerful tool, but does require some work on the users end. Moodle is useful for streamlining course grading. I can have students upload their assignments, then input their grades directly into the grade book. The Moodle quizzes are also easy to use and import grades directly into the grade book. I also like the ability to upload daily notes, videos, papers, links, etc. It makes my classroom more vibrant and informed when we all have access to a variety of course materials. "Not Bad as an Administrative Tool"
One of the best features of Moodle is the ability to share files within a committee or group at my institution. Instead of emailing a file around, the master file is put on the Moodle course for that group so we all have the same version to reference prior to our meetings. Moodle is sometimes a little bit clunky to use on a mobile device, but it's not the kind of resource that needs to perform flawlessly on a screen that small. For it's purposes, this isn't a deal breaker, but it can be a bit of a drawback on the fly. 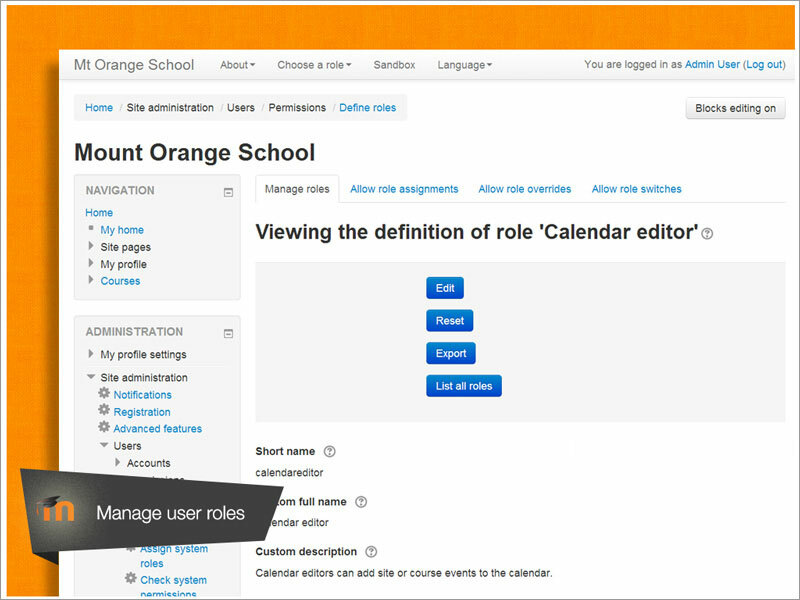 From the administrative side, Moodle has been a great way to organize materials across committees and classrooms. It is fairly easy to use and has increased productivity in a variety of ways. We can share materials prior to meeting with a group as well as store previous meeting minutes and upcoming goals to be accomplished so that we can stay on course with the committee objectives. Moodle allows administrators to share files from a committee or group without a hundred emails flying around. We tend to be pretty email heavy where I'm at, so any way in which we can cut down on large file sizes clogging inboxes is a good one. Moodle also allows us to look back at previous meeting minutes to reference our agendas. "Not a bad software for dealing with school"
I used Moodle for school, and I enjoyed that I was able to access previous courses as well as current ones. I also liked that it offered email forwarding so that I didn't have to worry about missing important emails when I wasn't signed in. Moodle recently did a re-haul, and the interface has greatly improved. I very much recommend it! The benefit of Moodle was being able to submit assignments, take quizzes, and just generally interact in a simplistic manner with my professors. One of the problems we solved using this software was how to distribute and then collect take-home exams. These needed to be handed out at the same time, as well as given a deadline for return. Because you're allowed to pre-program Moodle for this, we were able to administer the take-home exams. "Moodle is Ideal for Distance Education"
The cohort support within each Moodle 'course' made graduate school extremely easy. Being able to find assignments and resources before, during, and after thesis work was really helpful. I love being able to communicate with other classmates through the forums option; it is ideal for cohort-based distance education programs. You feel like you're part of the class, rather than just a participant. At first I thought the user interface was difficult to use/outdated, but after getting the hang of it I find it extremely easy to navigate. It's easy to go back and find different threads and course-specific information now that I have used it for a good amount of time. I've used both Blackboard and Moodle, and I find Moodle to be much more user-friendly. Be sure to navigate all the different functions at the beginning, because it will make things much easier later on. It's a great place to archive resources and forum discussions. For institutions looking to choose between the two, I would choose Moodle over Blackboard or Canvas! My favorite aspect of Moodle is that all of the resources, assignments, and forums are still available years after the course! It makes writing a thesis extremely easy, because everything is in one place as an archive. It also makes cohort-based distance learning (such as an international graduate degree program) extremely welcoming and effective. "A good software to organize student data and conduct online tests"
The software is user-friendly. Students intuitively browse the contents of their account. Online tests can be easily posted and immediate results of individual students can be displayed. Really nice for universities and schools who are interested in conducting online tests. Very good product. Really beneficial for universities. Good luck.
" Complete and free tool for the management of online courses"
It is a platform that meets the requirements for the administration and management of courses under the b-learning and e-learning (LMS) modality. There is a lot of material on the internet that explains the configuration and use of Moodle. There are different roles, which are configurable, that facilitate the work from the instructional design, the administration of the courses and participants and the tutorial of the same ones. The biggest problems have occurred at the time of updating the Moodle version, as there are problems with the databases. Another detail has to do with the size of the files to upload, since it does not allow large sizes, but this is a detail that is corrected in PHP.ini. "Free and intuitive eLearning Tool "
Moodle is a tool that is built upon community work. It is free, but it is powerful. It is a Learning Management System that allows one to create a catalogue of courses on several topics with content that ranges from videos and quizzes to HTML pages and books with embedded files. You do not need to use your money to be able to create eLearnings that will help you to train and develop your staff. To use Moodle to its fullest you will need something else that the ability to use its interface, but a little bit of knowledge in programming. CSS for the theme and HTML to improve the design of the content are a must! Give it a try! Since it is free, you have nothing to lose, but a lot to gain! We use Moodle to offer training not only to the internal staff of the company but also to all the stakeholders. With Moodle we can direct our budget to the content, that is what really matters, since the tool is free and can be customised. Additionally, is a intuitive tool that has many possibilities, and users can easily complete courses and improve their knowledge without investing time in learning how to use it. Great control of user access and activities, great assignment and evaluation tools. Quizzes are great as assigment and can be used in many cases. Visual appearance is very customizable and can be set to your companies visual identity with some HTML and programming work. A lot of time to set it up, it's desirable HTML knowledge to use it well. Its absolutely necessary to have programming skills to customize this software properly. We were not able yet to make it fully compatible with other education administration softwares we use here, but I think that's a resource limitation we have, not the software itself. Consider a programmer to costumize this software to your needs. Moodle is the platform that best fits in our working flow on e-learning activities, educational material sharing and course scheduling and evaluating. The previous software (unfortunatelly, I don't know what is it) did not reported user access data. Also, it allows us to post a great variety of online assignments that make our teaching capabilities wider. The ease of location and ability to let users find their items they are in search for. The options, or lack there of, to customize and deviate from the original color scheme or looks. This is a great solution for your students. This system is easy to use and with proper training, you will usually not have many questions from students unless there is a glitch in the system or something they cannot fix themselves. I usually have hardly any calls on individual issues for students. So as a huge recommendation, make sure you train the students well on the use of Moodle. We use this solution for our students to use and access their assignments. This is the "one-stop shop" for all of their grades, assignments, study material, and information for their classes and classwork. A benefit that we have come to realize is how easy it is to set up your classes for your students. You can give them work for the day or week. You can even set it up for units, so that your students only look through certain material. This lowers on confusion and allows students to study better and easier. "Much Better than other solutions." To set up a class is not that hard when you have some basic training. It is easy to upload files for the students to download for projects. The grade book is easy for the students to access as well. It is organized in a logical manner and its easy to find classes easily. Because it is open source its easy to find videos on how to do something or solve a problem. The mobile interface is really good, it makes it easy to do things on the fly. Its easy to rebrand for your University, ours called it On-Course. Some of the simplest things are buried in a menu. To turn on grades for students to see is hidden under a couple of menus. The grade book is not quick to set up this is much easier than in other classroom solutions. Though once it is set for a class its easy to import it each year. One of the biggest weaknesses is the Attendance module. Its hard to understand and takes way too long to set up. I still can't use it after using Moodle for several years. Make sure you have a good IT department for training less tech savvy professors. This is classroom software for higher education. It allow me to track grades, give assignments and post files for students to use. "good experience although it had a long learning curve"
It has a wide variety of activities with which you can evaluate the student, from the same application, without using add-ons. You can create evaluation activities to be carried out in groups and place the qualification to all the members of the working group. It has a lot of documentation and a large community of users in many languages. It is free and can be installed locally to test it before putting it into operation in the educational institution. Having so many options is easy to feel lost if you have previous training in the use of the application. Third-party plugins may stop working if their creator does not adapt it to the updates of the application. Keep in mind that if you do not have enough knowledge of administration of lms it is better to hire a hosting service that deals with the maintenance of the application and always make the respective updates. allowed to manage e-learning and b-learning courses at the university where I work, without making a strong monetary investment. I enjoy the access to past and present assignments and the ability for students to communicate to other students on the platform. I dislike that past courses are still displayed on the screen, whether they were from 2 years ago or one semester ago. Moodle has everything you need keeping assignments, grades, and communication all in one place. There is even a way for students to watch videos and links through Moodle which enhances student learning. It is a great solution if you are looking to hold an online class because everyone can be involved and active and up-to-date with the course. You can also see when students accessed the class page. It is an incredibly efficient way to run an online class rather than meeting face to face in a classroom. Teachers can communicate with students through the platform with grades and feedback as well as email and students can communicate with each other creating a positive learning environment. "A decent course management system"
Moodle has excellent customization options, allowing you to fiddle with the course to match your actual needs. I like the ability to easily add images and modify titles to feet the needs of each course. In addition, while the gradebook isn't quite as robust as Blackboard, it is powerful enough to work for most courses. Especially for a writing professor, it allows you to do things like upload feedback files, create rubrics, and collect student papers with little hassle. Given that it's an open-source platform, I think it offers basically everything that a professor needs to organize a class. The UI definitely needs to be streamlined in certain ways. Often, you find yourself clicking across multiple menus to find a certain feature, especially whenever you need to use the gradebook. While it generally will be suitable for most purpose, other course management programs have a wider set of features - for example, Blackboard has its own internal word processing program that allows you to comment directly on texts, which drastically speeds up the grading process. Other course management packages - like Blackboard - are easier to use and have a more robust set of features. However, for an open-source learning platform, it offers everything that needed for the typical professor. It simplifies the process of organizing course materials and student grades, which saves me from having to keep track of student papers and handouts. The gradebook makes it drastically easier to calculate grades at the end of the term. I've used a Moodle-based LMS at two different schools now and am overall happy with the functionality and features it offers me as a user. Managing course content is for the most part intuitive and easy. User experience and options are dependent on how Moodle is configured by the institution's IT or learning technology team/department, and the implementation I've seen has varied. Some deficiencies I noticed at one school were not present at the other and I discovered it was a result of how Moodle was managed on the back end. For example, one college did not enable the very simple text formatting in input windows, and the other college had not enabled the attendance logging features. So, if there are features you are looking for, I recommend reading the documentation on the Moodle site to find out if they are available. Strengths: online help, customizability, ease of use (creating and managing content), assignment and grade management, transferring/importing files and learning modules across semesters, assignment/submission management, adaptability, interactivity. As mentioned, Moodle is a solid LMS solution in my experience as a user, but I cannot speak to the back end enterprise software management side. Two issues I encounter that have more to do with efficiency than "problems," etc. * Moving Course Content within a Page: The issue I find most problematic as a user is navigating long Moodle pages for courses with heavy online content for the purposes of moving content modules between weeks. Pages can become very long and while the drag and drop feature is great, it is difficult to do when attempting to drag a module from let's say week 3 to week 9 - the scrolling down the page is sluggish, stutters, and inefficient. * Menus/Access to Editing Modules: The process for editing week sections, labels, assignments, etc., is less than convenient and intuitive. It seems there would be an "edit" icon next to each entry on a Moodle page to allow users to click and immediately go to the edit interface - often it is an icon that looks like a pencil and paper. Instead, users must click a settings icon that displays a pop-up menu with options that includes editing. * Search Capabilities: There is currently not much in the way of search capabilities within Moodle pages and user-created content. * Intuitive/Ease of Use: Moodle is less than intuitive in some areas, and while Moodle training (as with any software package/solution) requires some level of training, there are some features that could be more intuitive. Your mileage varies when it comes to training large groups of users and so making some features more intuitive would be helpful, especially for users who are not as computer/web/tech savvy as others. Refer to my other responses regarding recommendations. In my experience, Moodle is strong in the LMS categories I have observed: content authoring and management, learning management, course library functions, user management, and online testing and quizzes. "Great Platform for Online Courses"
Moodle is a great platform for completing online coursework. It provides a way to access course materials, send messages to the professor, interact with other students, and upload assignments. I also like that you can go back and view past courses as well, which is great for tracking down previous assignments/projects quickly and easily. The site is organized nicely, and everything is pretty easy to find. Every so often, the site glitches (just like most do at some point). When it glitches, it can take longer for things to post, or to receive communication for the course. Many improvements have been made, however, and this has gotten much better. This is a great software to use, and definitely one of the better ones to use for online coursework. The ease of use and the clear presentation of files and communication tools makes this a great platform for conducting/taking online coursework. Users can log in to the platform from anywhere in the world, provided they have an internet connection. This allows for global interaction and even better collaboration. "The de-facto standard but should be emproved"
Easy and fast to set up and to be production ready with small to medium installations . Intuitive usage experience that leads to an easy acceptance from the users . It also has very good contextual guides that allow you to obtain a decent user experinece with a really small effort . Performances are a N I G H T M A R E . . . As it is always the case with php , it's good for small to medium use case but does not fit " bigger " cases. Also community only support certain db forget it if you use oracle for example . The setup uses huge amount of R A M and is really hard to scale properly . Needs a lot of bare metal. sys admin ar e not happy about it . Really poor S . C . O . R . N . support . It is really hard to import data from other courses. "A Classroom Tool with Its Own Quirks"
I like that it creates a platform for learning outside of the Google Suite, as well as the functionality to use and share multiple types of media within an online class/forum. Users are able to add word documents, PDFs, and other types of files to posts with ease. The site itself resets after a while, and working on longer classroom assignments requires a watchful eye on the time. Too long on work and your work will NOT be saved. It is heartbreaking to say the least. As a student, I would be much happier using this program if I knew that my work would save automatically, avoiding any disappointment with future users. Be sure that other users are aware of the limitations to auto-saving capabilities. Individuals not a part of a Google account can participate just as fully with this application. Moodle has a great template for putting up the core material for class, whether it be middle school, high school, or college level. Also, The configuration is very flexible. Many of my colleagues have courses structured in a variety of ways. I typically use a weekly approach, with subcategories (divided by labels). I've also used a topic-approach for courses with a non-linear structure. I really like being able to post grades online, but the Gradebook is a bit clunky at times. I can't always see the entire page: if there are several columns and rows it is hard to move around on the page because the scroll bars do not remain on the screen view. Use every aspect of Moodle. Really dig in to what all it offers and it will greatly benefit you! Would definitely recommend it. I use it as a orientation advisor at Rutgers to help professors create new courses online for students to access and study for them. A great tool for both the professors and the students. "Good tool for interacting with students"
Easy to set up weekly learning objectives. Can include discussions/forums, required reading, presentations, links to videos and other materials, and quizzes. Additionally, students can easily upload assignments. It is a great organizational tool. Students can log onto Moodle from anywhere to access the weekly schedule. Moodle also has a Quickmail option for emailing one or more students. Course set-up is not 100% intuitive. I often need to access the help option. Also, cannot copy text formatting from one week to the next. For example, if I copy text that is bolded and a larger size, it will paste using the default formatting which is not bold and a smaller size. I prefer Moodle over Blackboard. Moodle saves time by keeping me organized. I no longer need to refer to my syllabus or search my email looking for student assignments. Everything is in one place. "Moodle - Use it ONLY when Required"
The best feature about Moodle is how easy it is to set up a grade book and to email students simultaneously. It's easy to communicate final grades with the Registrar's Office. Beyond the features that I have mentioned that I like, Moodle is clunky and not user-friendly. It's slow. If you try to set up an online question bank for quizzes, it takes about 2 minutes to upload a single question, meaning that writing exams takes a full weekend of working. Sometimes, grades go missing. Sometimes it changes the weights of assignments without informing people, leading to panicked students. I would suggest either using it only to host your grade book. Otherwise, try for Canvas. It works so much better than Moodle. We use this as an LMS to keep students grades easily visible to students, to organize classes, and stuff like that. Moodle's vibrant global community of users and developers. I also love Moodle's flexibility. 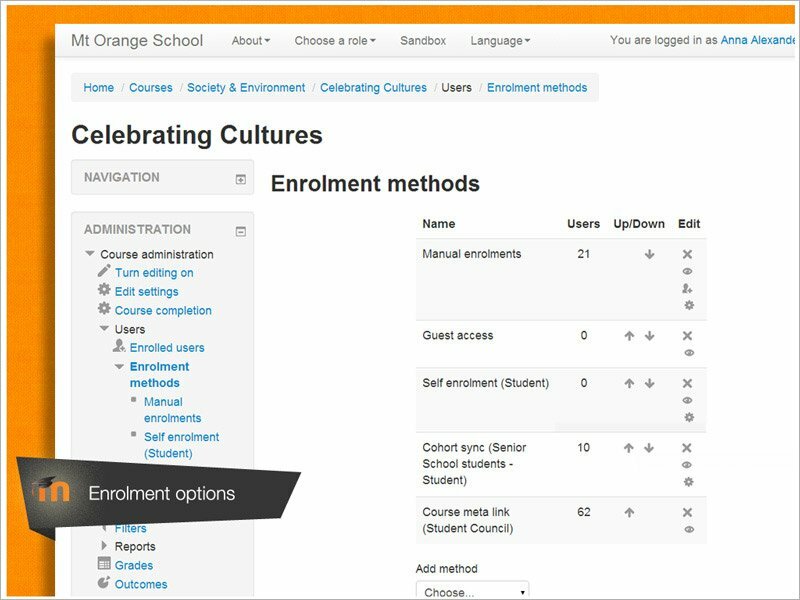 Every Moodle site is different and can be customized to the needs of its users. Because Moodle is open source, the order in which certain problems are addressed by developers isn't always in alignment with how I would prioritize things for my own site's needs. Moodle is a great platform, but it is not right for everyone. Open source software is great, and Moodle doesn't cost a cent, but there are tradeoffs. Important considerations include staff expertise, hosting, and user support. Moodle Partners can provide these for a fee but many Moodle users choose to provide these themselves. Small teams and organizations may be happy with a standard web host but larger teams or sites with thousands of users will likely require the resources of a Moodle partner unless in-house staff can provide the necessary technology support for users and site administration tasks. I use Moodle with many of my clients to provide training at a distance, to supplement in-person education, and even to conduct webinars or product reviews. I also use Moodle to teach courses at my local university. "Great product once you figure it out!" Great platform for managing a class remotely. I love the collaboration features. It's not completely intuitive. So I had to view several tutorials until I learned how to create a class. Installation was easy through cPanel. But configuring was a real challenge. It's not really intuitive to set up a class. This may because my preconceived notion of what goes into setting up a class was unrealistic. It's a bit technical to figure out, but worth it. Managing the academic component of students performing internships. I can keep students engaged through the program and only meet with them once per week. This is a real time saving feature. "Moodle is good, but could be better." It's an efficient resource to have when each class utilizes it, which is the case for me. All documents that I will possibly need in a semester will be in one location. The mobile site lets me download any pdf, powerpoint, word docs directly into my browser on my iPhone. Check marks next to each uploaded file can remind you if you have or have not downloaded something, or you can use it for your own individual studies to see what else you must complete. The help section is quite limited. It has been difficult to find a way to change your password, for instance. It really should be easier to use the dashboard for the help section. In addition, there should be more shortcuts to the home page. It takes a lot of clicks to get to one class because of the way the classes are titled. Overall, the system isn't customizable enough for my liking, and would work a lot better if you were able to move docks around more. I would recommend you take the tutorial if there is one offered to make your usage of the website the most efficient. It is the one spot hub where all documents will be that are needed for all students. You are able to open these documents anywhere, especially on mobile devices. This is important for me, because I am able to open any document I need when I am on the go and on my long commute during the mornings and evenings. "Get your own LMS within Minutes"
Moodle is a great project for leaning management system. You can create courses and user can subscribe to these. it has got great access control features which the task much simpler. You can customize it to meet your needs.You can create user groups. The progress by each user for each courses can be tracked very well. Performance is a major issue with Moodle, when user load exceeds a certain limit, it start giving performance issues.For for big organisation you must scale systems to meet your needs. It is great tool,if you want to have your own training porgrams moodels is the best tool. We had customized moodle to provide training our new resources. Our new joinees need to complete a special training program using moodle. Moodle is fairly easy to access, and more or less simple to navigate. There are many spelling errors in the program due to its origin in another country. The navigation appears to be backwards of what we're used to here in the US. Explore its options before diving in to participate or create a class. Many of the options seem to be simple, but work in an "inverted" way. For example, the "breadcrumbs" at the top of each navigation page don't go in the order in which the pages are navigated. They, many times, are either backwards or in a seemingly inverted order. Also, there are many spelling errors in the site due to translation. We use Moodle for district-wide professional development classes. It's easy to coordinate with teachers in other buildings without too much extra effort. "Moodle is easy and efficient "
We use moodle for our online courses. I think the workshops themselves are easy to navigate thanks to moodle. The extra features like being able to send messages to all the participants enrolled in a course is also a nice touch, it gives administrators, teachers, and students another way to communicate easily. There isn't much that I don't like. For the my user purposes moodle does everything it needs to. If I did have to pick something that is a slight annoyance I'd say when you're searching users sometimes you need to clear the filters before creating a new search. It'd be nice if that didn't carry over once you are searching a new name. Moodle helps us run our online courses, it also keeps a reliable list of enrollment numbers and names for our online courses. It is efficient for what it was intended for.